Roads: The main roads are sealed in generally in good condition. Inside the game reserves the tracks are all offroad tracks that can be very bad and extremely muddy when raining. Weather: Warm till very hot (often over 35 degrees). Late in the afternoon is mostly got a bit cloudy and a few times we had a bit of rain. Weather: During the day about 20 degrees. During the night pretty cool. During the days we crossed the Trans Kalahari Highway we had mostly cloudy sky and in the mornings quite a lot of rain. ATM's: ATM's for Visa are widely available. Safety: Botswana is a safe country with a very low crime rate. Camping inside the game parks can be risky as they are not fenced. So always act wisely. Camping: There are many camping possibilities but there are big price differences. The prices are roughly between 30 and 80 Pula per person per night. Camping costs in the national parks depends highly on the campsites you use as many are exploited by private companies. Public campsites run by the DWNP (Botswana Wildlife Department) are reasonably prices but the campsites run by private companies like BigFoot are very expensive. Many nationalities do not need a visa for Botswana. You just get an entry stamp on the border that allows you to stay for maximum 90 days. ENTRY 2015: We entered at Kazungula on the border with Zimbabwe. Entry was quite easy. Just beware of the food you are carrying. At the border they check for meat, dairy products and fruits. When they find stuff that is not allowed you might have to throw it away. In our case a lady really checked our fridge. Also our Carnet was checked when we entered the country. The insisted on seeing it. The visa stamp was free of charge. Other costs were Roadfund, tax and insurance. This was a total of 150 Pula or 200 Rand (only cash and USD are not accepted). Exit 2015: We left at Buitepos on the border with Namibia (Trans Kalahari border post). Leaving the country was quick and easy and without any costs. ENTRY 2007: We entered at Kazungula on the border with Zambia. To cross the border at this point you have to need the ferry across the Zambezi. The ferry runs between 6.00 and 18.00 and costs 20 USD for 2 persons and a car. If you are a foreigner you have to pay in USD. Passport and Carnet are quickly stamped and there were no further costs. It seems that you have to pay 120P roadtax and 20P roadfund but nobody asked us. In order to prefend the spreading of animals diseases it is forbidden to import fresh meat. On the border they seem the check your fridge, but also here nobody asked us. The only thing we had to do was drive our car though a pool of desinfection fluid. When entering Botswana we had no Pula's, but because we did not had to pay anything we did not needed any. Exit 2007: At Mohamba on the Namibian border. Quick and easy and without any costs. ENTRY 2007: We entered at Buitepos on the border with Namibia. This was the second time we entered Botswana within the same year but this was no problem. We got a new visa for free. This time however we did had to pay for the car. We paid 50 Pula for the road permit (which was for a car of less than 3500 kg and for a one way trip) and 20 Pula for the roadfund. EXIT 2007: At Lobatse on the border with South Africa (Pioneer borderpost). Quick and easy and no costs. Chobe NP 2015: 120 Pula per person per day and 50 Pula for the car. Camping is 30 Pula per person per night. Chobe is a very nice park and full of animals. Chobe River Cruise 2015: 290 Pula per person (booked at the Chobe Safari Lodge). A two hours cruise leaving at the end of the afternood and returning just after sunset. Very nice experience. We saw large numbers of animals such as large groups of elephants. Very tourist but definitely worth the money. Elephant sands lodge 2015: Nice lodge and campsite around a small waterhole that is often visited by large herds of elephants. Central Kalahari game reserve 2015: Entrance fee 120 Pula per person per day and 50 Pula per day for the car. Second largest reserve in the world and known for its predators. Unfortunately we did not see any. Being there at the end of the rainy season it was less open than we expected. All tracks connecting the open pans were surrounded by thick bushes (lots of scratches on the car). Just after the rains the tracks were pretty bad. Also watch out for rats. We had one in the car and under the bonnet causing lots of damage. As campsites are limited and popular you should book well in advance. Campsites are operated by the DWNP or private companies like BigFoot. The privately run campsite are expensive. The public campsites from DWNP cost 30 Pula per person per night. Campsites are large, unfenced and each has it's own toilets and bucket shower (as there is no water you must bring your own). Depending on the season it can be very hot here. Kgalagadi Mabuasehube section 2015: Great national park and very cheap. Entrance fee is 20 Pula per person per day and 4 Pula per car per day. Being there at the end of the rainy season it was beautiful. Lush green bushes and a sea of yellow flowers covering the red sands. The tracks in the park were better than in the Central Kalahari. We also saw much more animals here (however this might depend on the season). Just like in the Central Kalahari also here campsites are limited and very popular. Booking in advance at DWNP is a must. Price for camping is 30 Pula per person per night. Campsites are large, unfenced with pit latrines, bucket showers and shelters. Only few campsites have a water tap and some only give water after the rains. For us the best sites were Mpaaya and Khiding. Mpaaya 1 is famous as lions tend to visit the site very often. Also Khiding is known for lions visiting. At Mpaaya we also had a brown hyena on the campsite. Savuti (Chobe NP) 2007: 120 Pula per person per day and 50 Pula for the car. Camping is 30 Pula per person per night. Nice place with great sandy tracks.Close to the campsite there is an artificial waterhole that attracks lots of animals. Moremi NP 2007: Nice game parks on the edge of the Okavango Delta covered in a labyrinth of nice tracks. Getting lost here is part of the fun. Driving here you get the real bush feeling. On the campsite we had elephants next to our car the whole night. Boattrip on the Okavango Delta 2007: From Xakanaxa campsite in Moremi we did a boattrip on the delta. The trip was nice although we did not see any animals. The sunset however was beautiful. The price for a boat is 350P per hour. In total you can go with 12 people. So sharing makes the trip cheaper. We were allowed to join a big family and saved a lot of money. Makgadikgadi Pans 2007: Large white salt pans. In dry season you can cross the pans. However as soon as they are wet you should not get on them as you sink right through the surface. Unfortunately when we were there, the rainy season had just started and we could only see them from the edge. The best experience should be driving over the pans on a quad bike. Also for a quad bike the pans were too wet. If you are interested you can make bookings at Planet Baobab in Gweta. Capman Baobab 2007: From Gweta there is a road going south to the Ntwetwe Pans. In dry season you can cross the pans to exit on the south and drive on the the Kalahari. From Gweta to the edge of the pans you will come across two big baobab trees. The last one, Capman Baobab is the biggest. It has a circumference of about 25 meters. General: all the main roads we drove were sealed and in pretty good condition. The only off road tracks we drove were in the National parks. Chobe gate (north) - Ihaha camp (Chobe): 4x4 only. 30 km sandy piste. On some place the sand is deep and soft. Rakops - Matswere Gate Central Kalahari - Deception Valley: Sandy offroad track. Extremely muddy after heavy rains. We drove this track 2 weeks after heavy rains and still large parts of the track were covered with thick mud and large mud pits. From other travellers who were there two week during the rains, we heard that it was not driveable. Large number of vehicles got stuck and they all had to turn back. Central Kalahari: all tracks are offroad and in various conditions. Tracks around deception pan can be very muddy and slippery when wet. There are also lots of small sandy tracks through thick bush. Be prepared to gather many scratches on you car. Hukuntsi - Mabuasehube gate Kgalagadi NP: Sandy offroad piste. Some parts are deep soft sand. The track gets better (less soft) as soon as you reach the crossing from where the track will follow the borders of the national park. Kgalagadi NP, Mabuasehube section: All tracks inside the park are offroad but not very bad. Some are soft sand (but not as soft as the track to the gate) and some are a bit rocky. Most tracks however are good and nice to drive. Ihaha camp (Chobe) - Ngoma gate (Chobe South) 4x4 only: Piste, sometimes rocky but mostly sandy, especially the last part just before the gate. Here the sand is deep and soft. Ngoma gate (Chobe South) - Ghoha gate (Savute North) 4x4 only: In total about 80 km. The first 40 km is gravel with some corrugation. Look out for the "cantrees" to scare elephants. The last 40 km is deep soft sand. This sandy stretch however is very beautiful. Ghoha gate (Savute North) - Savute camp 4x4 only: 30 km sandy piste. Sometimes the sand is very soft. Close to the campsite there is a waterhole that attracks many elephants. Driving past them may be scarry, but nothing will happen. Just drive slowly they are used to traffic. Savute camp - Mababe gate (Savute south) 4x4 only: 64 km sandy piste. On a certain point the road splits into the marsh road and the sandridge road. Both end up in the same place. The marsh road however should be extremely bad even in dry season. When we were there rainy season had just started and many people got stuck. We took the sandridge road and that was OK. The first part was very sandy and the last part rough with deep tracks (probably very muddy when wet). Mababe gate (Savute south) - Moremi North gate 4x4 only: 47 km / 3 hours. The first part is a rough track that will be very muddy when wet. The last part is sandy but not soft. This is one of the most beautiful tracks we have ever done. You drive along the Kwai river and there is an abundance of animals and very beautiful scenery. Xakanaxa camp - South gate Moremi 4x4 only: 75 km / 3 hours. Sandy track with sometimes very deep and soft sand. South gate Moremi - Maun: 100 km. Partly gravel and the last 45 km tarmac. Maun - Gweta: 222 km / 3 hours. Good tarmac. From tarmac to Nxai Pan gate 4x4 only: 38 km very bad piste. The first part soft sand and the last 12 km very rough hard sand with many bumps and holes. Maun - Sehithwa: 90 km / 1 hour. Good tarmac, many cattle close to the road. Sehithwa - Mohamba: 335 good tarmac. Trans Kalahari Highway: About 800 km good tarmac. Lots of cattle on the road. In Botswana fuel is much cheaper than in Zambia or Zimbabwe. So filling up here saves you a lot of money. Just after you have crossed the border you will find a petrol station in Kazungula. To camp in the National Parks you officially must have a permit. To get this permit you must make a reservation at the headquarters, but as much of the bigger travel agents make bookings far in advance you will most likely be unsuccessfull unless you do this very early. Everywhere we went they told us it was fully booked. In 2008 we just went over there and it was always possibility to stay. In 2015 this was more difficult. Especially when you want to stay on a specific campsite (i.e. in Central Kalahari) or when you want to stay on the public sites run by the DWNP. So booking in advance is getting more and more an issue especially for the Central Kalahari and the Kgalagkadi as the have only a limited number of campsites. For the holidays seasons you might have to book months in advance. Booking can be done through internet or at the offices in Kasane and Maun. Without advanced bookings we able to get a few spot in the Central Kalahari (in 2015) but they were not the best ones. Keep in mind, that regardless the time you enter, you always have to be out of the National Parks at 11:00 AM the next morning. Kasane, Chobe Safari Lodge. On the Chobe river. Offers good food and different activities (we liked the River Safari). Campsite is popular with South Africans and can be full during holiday season. Free Wi-Fi at the reception. Price 170 Pula per night for 2 persons and a car. Near Nata, Elephant Sands. Nice campsite near a waterhole that is frequently visited by elephants. If you're lucky you can watch the elephants from the swimming pool. Wi-Fi at the reception (not for free). Price is 180 Pula per night for 2 persons and a car. Gweta, Planet Baobab. Nice lodge with good camping. Each site has it's own shelter and power supply. The restaurant serves good food, good ablution and it has a good swimming pool. Wi-Fi in the restaurant as well. Price is 146 Pula per night for 2 persons and a car. Maun, Sedia Hotel. Behind the hotel is a large campsite. Ablution is fine. There is free wifi in the restaurant. Food is not that great. Good swimming pool. Price is 100 Pula per night for 2 persons and a car. 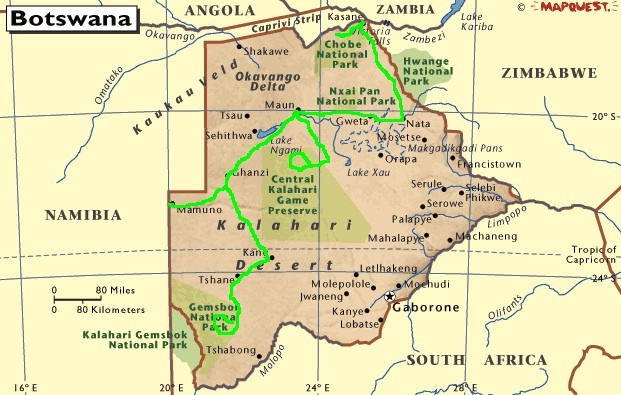 Central Kalahari Campsite Kori 4. Very nice spot. Must be booked in advance through DWNP. Price is 30 Pula per person per night. Central Kalahari Campsite Deception 3. Site does not have the best view. Must be booked in advance through DWNP. Price is 30 Pula per person per night. Ghanzi, Tautona Lodge. Good campsite with great ablution. Downside ; the lodge keeps wild animals like lions and wild dogs just to please customers. Price 260 Pula per night for 2 persons and a car. Kang, Kalahari Rest. Nice partly fenced Campsites with basic ablution (donkey for hot water). Although basic we really liked this place. No Wi-Fi. Price 200 Pula per night for 2 persons and a car. Kgalagadi NP, campsite Khiding. Campsite frequently visited by lions. Must be booked in advance through DWNP. Price 30 Pula per person per night. Kgalagadi NP, campsite Monamodi 1. Not the best view, but it has a tap with running water (may not be working in dry season). Must be booked in advance through DWNP. Price 30 Pula per person per night. Kgalagadi NP, campsite Mpaaya 2. Site with amazing view. Especially after the wet season when the flowers bloom. Site has running water (maybe not in dry season). Must be booked in advance. Mpaaya 1 is ofted visited by lions. Price 30 Pula per person per night. Maun, DWNP booking office. You can also book Central Kalahari and Kgalagadi here. Border between Botswana and Namibia, Trans Kalahari borderpost. Ghanzi, Gate to Tautona lodge. Chobe NP S17.50.484 E024.52.748 Ihaha Camp Officially you have to make reservartion. From this campsite on the edge of the Chobe river you have a nice view on the plains on the other side. Campsite is not fenced so animals roam freely. Toilet and shower. Savute S18.33.912 E024.03.821 Savute public campsite Officially you have to make a reservation. Campsite is not fenced so animals roam freely. Toilet and shower. Moremi NP S19.10.332 E023.45.193 Moremi North Gate Officially you have to make a reservation. Campsite is not fenced so animals roam freely. Toilet and shower. Moremi NP S19.10.933 E023.24.929 Xakanaxa campsite Officially you have to make a reservation. Campsite is not fenced so animals roam freely. On the campsite you can book a nice boatrip onto the Delta. Toilet, shower, braai, tap. Maun S19.57.193 E023.28.688 Sedia Hotel Nice campsite behind a very luxorious hotel. Toilet, hot shower, internet, booking office, restaurant, swimming pool, tap. Gweta S20.11.390 E025.18.436 Planet Baobab Nice but expensive place. You do however have a very nice swimming pool. Toilet, hot shower, restaurant, shelters, booking ofice (quad bike tour onto the pans), swimming pool. Maun S19.59.283 E023.25.554 Rileys Opposite the Delta Medical Clinic you will find Rileys. He has a shell station, a very good workshop (better than the Landrover garage) and a shop. Ghanzi S21.43.454 E021.38.932 Khawa Lodge Not very special. Hot water and toilet available.